note: The schedules have changed regularly throughout the past couple of years, and all the information I found online was outdated. So on January 22, 2016, I went to the El Nido Bus Terminal, took these pictures, and spoke with several drivers to confirm that this is the most recent schedule for the Cherry and Roro Bus. 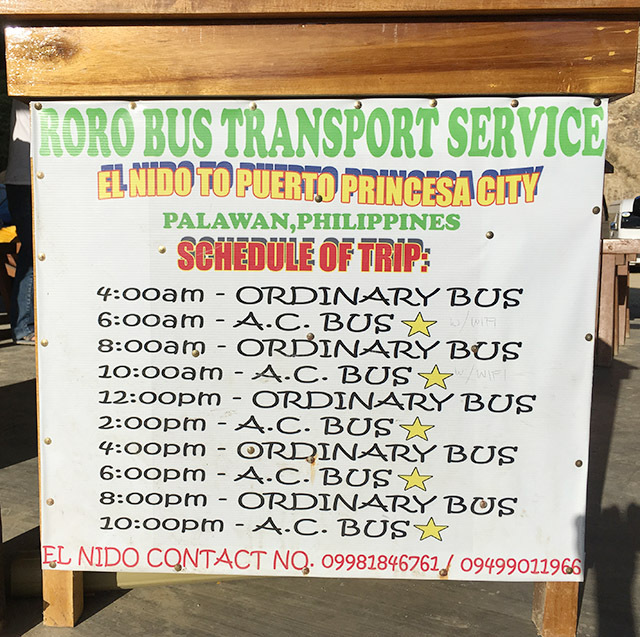 The Roro and Cherry Bus buses depart and arrive at the San Jose Market and Bus Terminal about 15-20 minutes from downtown Puerto Princesa, and the El Nido Bus Terminal about 10 minutes from downtown El Nido. Please note: both bus companies offer air-conditioned and non air-conditioned buses. The non air-conditioned buses take a little longer to make the trip (~7 hours), as they tend to make more stops to pick up local passengers along the way. You can make reservations for the Cherry bus here, however tickets are usually readily available at the bus terminals. Reservations are currently not available for the Roro Bus and can be purchased when you arrive at the Bus Terminal. Both bus lines make stops at TayTay and Roxas for bathroom breaks as there are no bathrooms on board. The bus terminal in Puerto Princesa does have public bathrooms for a 5 peso fee, but there is only water and no toilet paper. The bus terminal in El Nido has bathrooms and if they are closed in the evening (as they were the last time we took the 9pm Cherry Bus), you can go across the street to the El Nido Market and use the bathrooms there. 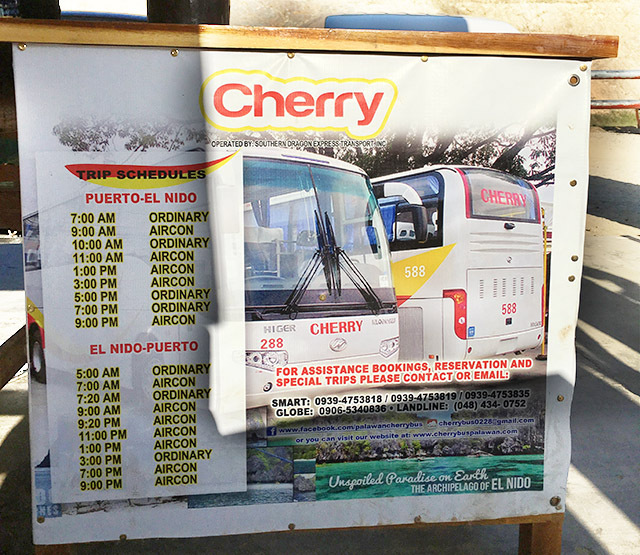 Cherry Buses are newer than Roro Buses, and are what we usually take when traveling to Puerto and back. Wifi is supposed to be on Cherry Buses, but it hasn’t worked for us so we always carry a pocket wifi when traveling in Palawan. If you miss one bus, you won’t have to wait too long for the next Cherry or Roro Bus as they pretty much run hourly. Ordinary Roro buses are smaller than aircon buses.